Digital Paintbook Vol. 2 gives an exclusive glimpse behind the scenes of the most successful US-American TV series Game of Thrones. Matte Painter Sven Sauer talks about the development of the 67 environments that had to constitute the ctitious world of the TV saga. Four tutorials and one making of by professional digital artists, yet another article considering grounds of software knowledge and the reader’s gallery form the content of this workbook. 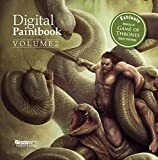 Readers can follow the generation of the Greek mythology inspired motif of Hercules and Hydra and for the rst time the book introduces the softwares ZBrush, Cinema 4D and their possibilities.